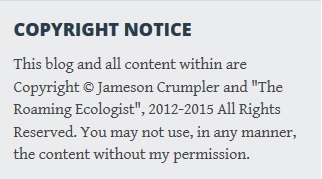 Please note the Copyright notice on the main page, where it has existed as shown below since this blog was intially published in September 2012. While I very much appreciate sharing of my work, I would like a simple notice or request for permission to use any of my work associated with any kind of official organizational capacity or for re-publishing on your blog, website, electronic newsletters, etc., (typically a one-time request if subsequent uses are similar). Note that sharing (via social networking) is not the same as re-publishing, and no permission is needed for social media sharing. Sharing involves linking to the material and re-publishing involves a word for word re-production. Facebook sharing and Twitter sharing/postings I have no control of, obviously (nor do I wish to) and that manner of sharing usually denotes the source automatically when shared from the original source (i.e. “via The Roaming Ecologist/Jameson Crumpler”). No requests for permission are needed in regards to social media sharing, so share away! Also note that any posts on this page that are re-published works of other authors are used with their and/or the publisher’s permission (i.e. “What the Prairie Teaches Us” by Paul Gruchow; used with permission from Milkweed Press). That permission has been granted to me only for the use on this blog and is not a blanket permission for you to use. You will need to obtain such permission yourself.